The state’s medical director is warning users of hand sanitizers not to go overboard. During the flu season, the Iowa Department of Public Health has recommended using hand sanitizer when soap and water aren’t available. But, Dr. Patricia Quinlisk says it doesn’t much to do the trick. Some concerns have been raised about small children putting their hands in their mouths after using the product, but Quinlisk says they should be fine as long as they are applying it properly. “Our recommendation is go ahead and use the hand gels when you don’t have access to soap and water but if the hand gels are being used by young children just make sure they use them correctly…just a dollop should be enough,” Quinlisk said. 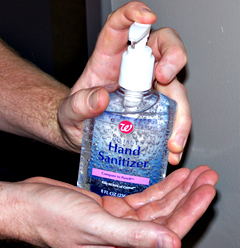 Hand sanitizer has become a staple in schools, daycares, and hospitals during the flu season. Quinlisk recommends using a gel that contains up to 10% alcohol.